Located in Charlotte, Fairfield Inn & Suites by Marriott Charlotte Matthews is within a 15-minute drive of Bojangles' Coliseum and Ovens Auditorium. This hotel is 8.3 mi (13.4 km) from SouthPark Mall and 9.2 mi (14.8 km) from Spectrum Center. Make yourself at home in one of the 88 air-conditioned rooms featuring refrigerators and microwaves. LCD televisions with cable programming provide entertainment, while complimentary wireless Internet access keeps you connected. Private bathrooms with shower/tub combinations feature deep soaking bathtubs and designer toiletries. Conveniences include safes and desks, and housekeeping is provided daily. 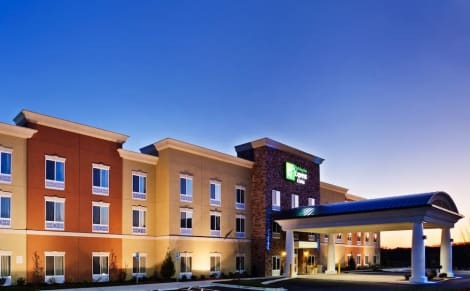 Located in Matthews, Holiday Inn Express & Suites Charlotte Southeast - Matthews is within a 15-minute drive of Bojangles' Coliseum and Ovens Auditorium. This hotel is 10.1 mi (16.3 km) from SouthPark Mall and 10.2 mi (16.4 km) from Spectrum Center. With a stay at Comfort Inn Matthews - Charlotte, you'll be centrally located in Matthews, within a 15-minute drive of Bojangles' Coliseum and Ovens Auditorium. This hotel is 9.3 mi (15 km) from SouthPark Mall and 10.1 mi (16.3 km) from Spectrum Center. Make yourself at home in one of the 79 air-conditioned rooms featuring refrigerators and LCD televisions. Complimentary wireless Internet access keeps you connected, and cable programming is available for your entertainment. Partially open bathrooms with showers feature complimentary toiletries and hair dryers. Conveniences include laptop-compatible safes and desks, as well as phones with free local calls. Make yourself at home in one of the 62 air-conditioned rooms featuring refrigerators and flat-screen televisions. Your bed comes with premium bedding, and all rooms are furnished with sofa beds. Complimentary wireless Internet access keeps you connected, and cable programming is available for your entertainment. Bathrooms have shower/tub combinations and hair dryers.